Risks in Mining Projects: Can Geospatial Solutions Help? Can Geospatial Solutions Help Assess the Risks of a Mining Project? Although the life cycle of a mining project may be broken down into very few steps (exploration, development, production, rehabilitation), it may last over several years, and even decades. There are many risks inherent to each of these steps, and they are all quite different from one another. Let us specifically think about the financial risks or risks of impacting the environment whose consequences may result in investors losing confidence and the project failing. How can we better manage and especially evaluate these risks? The answer partially lies in geospatial solutions, namely remote sensing and geographic information systems (GIS). At the Exploration stage, mining companies require crucial information to be able to evaluate the potential of a site: territorial conditions (accessibility, environment), geological characteristics (structure, alteration), and the best targets to investigate (integration of geophysical and geochemical data). In order to draw up a clear and precise profile of mining potential, several EO solutions can support the research for this information, in particular, high precision topographical maps, mineral maps, structural maps and target maps. 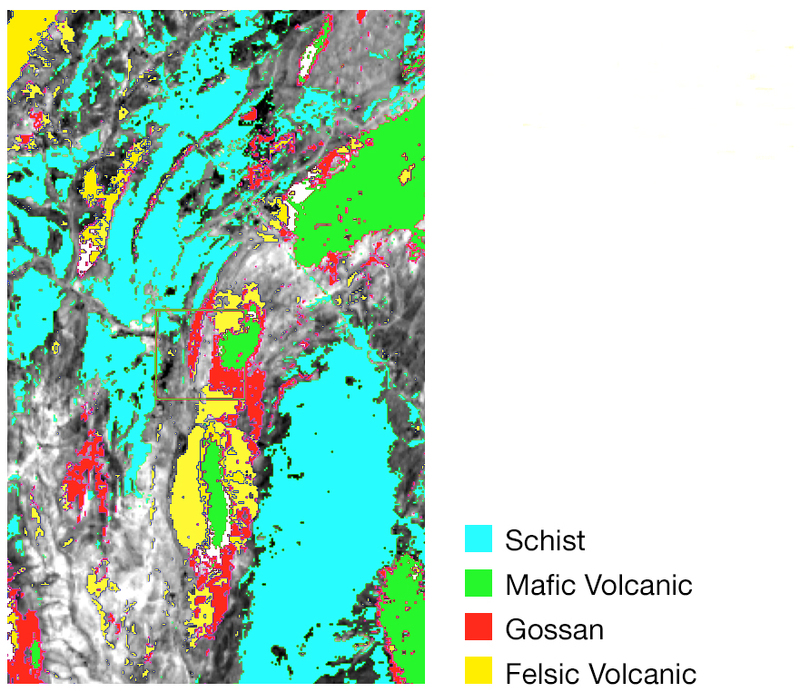 For example, as part of a spectral analysis, mineral indicators associated with specific lithological assemblages or with hydrothermal alteration zones can be identified. The information collected thus allows to better understand the stratigraphic framework and to quickly target favourable areas for exploration. 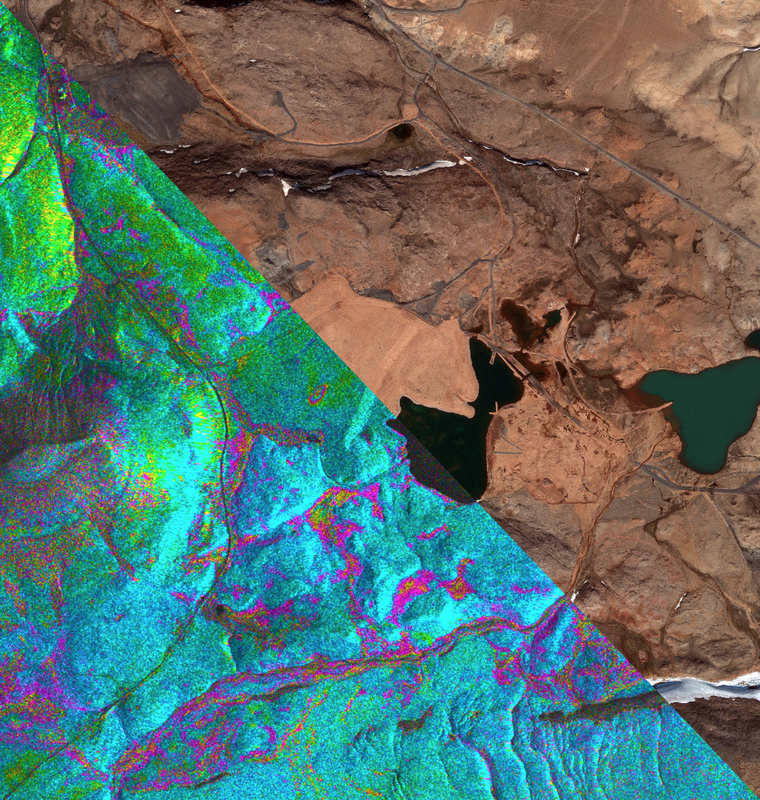 After making a discovery, high precision topography, derived from high-resolution satellite images, represents an essential reference for drilling campaigns and resource evaluation. These high-value added solutions thus back certain decisions and build up confidence in this important step of mapping a mining project. Legend: Mineral map produced from Hyperion hyperspectral satellite data, Morocco. There are different needs for the production and rehabilitation stages of a mining project: infrastructure design and construction, mineral extraction management, mine tailings management, replanting, planning, dismantling infrastructures, among other things. Earth Observation solutions help make these activities and their associated risks easier to manage. The detection and follow-up of the soil movements and structures are carried out using an innovative solution: radar interferometry. Radar interferometry allows to produce digital surface models (DSM) over very large surfaces and to detect with centimetre-level precision very small soil deformations or structural movements. Land occupation status and rehabilitation activity monitoring can be mapped and carried out using high-resolution satellite data (Pléiades, WorldView satellite images). This supports the interactions with stakeholders as well as the attaining of sustainable development targets. Why it is so important and fundamental to evaluate the risks associated with a mining project? Mainly to improve the decision-making process. Thus, having greater knowledge of a mining site, accelerating any discoveries, monitoring mining operations and better human resource planning on site are but a few positive outcomes of evaluating the risks and consequently reducing costs. As for you, if you had to manage a mining project, would you be willing to use remote sensing and geographic information systems solutions to evaluate the risks? Do you want to learn more about risk management for mines, oil and gas? Contact Effigis and receive a customized solution for your project.